You are here: Home / Archives for Genon Electric Inc.
[INQ. NO. 1410M11] As a specialized firm of automotive electronic products, Genon Automotive Electronics was established after being spun-off from Daewoo Group, equipped with technological experience developed over a number of years on electronic components and human/physical networks as well. This creative company manufactures alternator regulators & rectifiers for automotive. Current hot export destinations include the U.S.A, Japan, Russia, Egypt, Australia, Venezuela, etc. This company has highly experienced engineers in their most 20 years in automotive manufacturing sectors. And the majority of its engineers have previously worked for Daewoo. Now this company can provide various kinds of alternators, starter motors, and other auto parts especially for Korean-made cars. It has now as many as 250 kinds of alternator regulators. The alternator regulator regulates the output voltage of generator for constant proper level of automotive battery voltage and sends a warning to drivers in a time when an abnormality occurs in the generator. Most of its products are for Korean cars, but some are also manufactured for 20 nations including Japan, Russia, Turkey, Vietnam, Egypt, China, and the U.S.A. Growing markets for the company include Germany, Brazil, and Mongolia. [Serial No. 2013-B-049] As a specialized firm of automotive electronic products, Genon Automotive Electronics was established after being spun-off from Daewoo Group, equipped with technological experience developed over a number of years on electronic components and human/physical networks as well. This creative company manufactures alternator regulators & rectifiers for automotive. Current hot export destinations include the USA, Japan, Russia, Egypt, Australia, Venezuela, etc. This company has highly experienced engineers in their most 20 years in automotive manufacturing sectors. And the majority of its engineers have previously worked for Daewoo. Now this company can provide various kinds of alternators, starter motors, and other auto parts especially for Korean-made cars. It has now as many as 250 kinds of alternator regulators. The alternator regulator regulates the output voltage of generator for constant proper level of automotive battery voltage and sends a warning to drivers in a time when an abnormality occurs in the generator. Most of its products are for Korean cars, but some are also manufactured for 20 nations including Japan, Russia, Turkey, Vietnam, Egypt, China, and the USA. Growing markets for the company include Germany, Brazil, and Mongolia. [INQ. NO. 1408M08] As a specialized firm of automotive electronic products, Genon Automotive Electronics was established after being spun-off from Daewoo Group with the technological experience for a number of years on electronic components and human/physical networks as well. This creative company manufactures alternator regulator & rectifier for automotive. Current hot export destinations include the U.S., Japan, Russia, Egypt, Australia, Venezuela, etc. This company holds highly experienced engineers in their most 20 years in automotive manufacturing sectors. And majority of its engineers have once worked for Daewoo. Now this company can provide various kinds of alternators, start motors, other auto parts especially for Korean-made cars. It has now whopping 250kinds of alternator regulators. The alternator regulator regulates the output voltage of generator for constant proper level of automotives battery voltage and sends a warning to drivers in a time when the abnormality is occurred in the generator. Most of its products are for Korean cars, but some are also manufactured for Japanese and European cars. The alternator rectifier changes the AC voltage generated in the automotive generator into the DC voltage to operate cars(Vehicle needs a rectifying process because alternator makes alternating power). This product is applied at automotive generator for passenger and commercial vehicles. 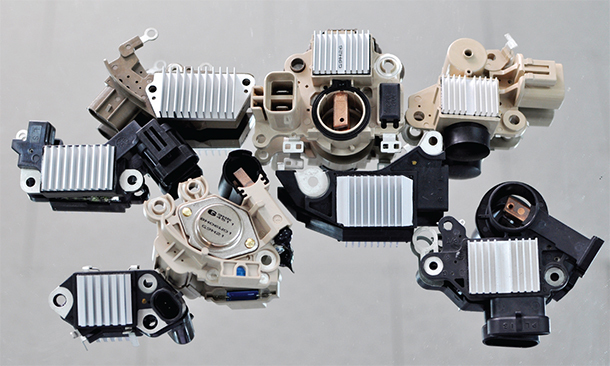 Now for Korean cars, 30types of alternator rectifiers are manufactured. 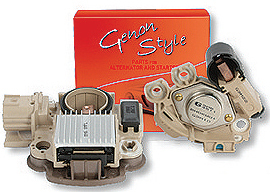 As a specialized firm of automotive electronic products, Genon was established after being spun-off from Daewoo Group with the technological experience for a number of years on electronic components and human/physical networks as well. This creative company manufactures alternator regulators &rectifiers for automotives. Current hot export destinations include the U.S.A, Japan, Russia, Egypt, Australia, Venezuela, etc. This company has highly experienced engineers mostly with 20 years’ experience in the automotive manufacturing sector. And the majority of its engineers have once worked for Daewoo. This company can provide various kinds of alternators, start motors, other auto parts especially for Korean-made cars. It has a whopping 250 kinds of alternator regulators. The alternator regulator regulates the output voltage of generators for constant proper level of automotive battery voltage and sends a warning to drivers in a time when the abnormality is occurred in the generator. Most of its products are for Korean cars, but some are also manufactured for Japanese and European cars. The alternator rectifier changes the AC voltage generated in the automotive generator into the DC voltage to operate cars (Vehicle needs a rectifying process because the alternator makes alternating power). This product is applied at automotive generator for passenger and commercial vehicles. 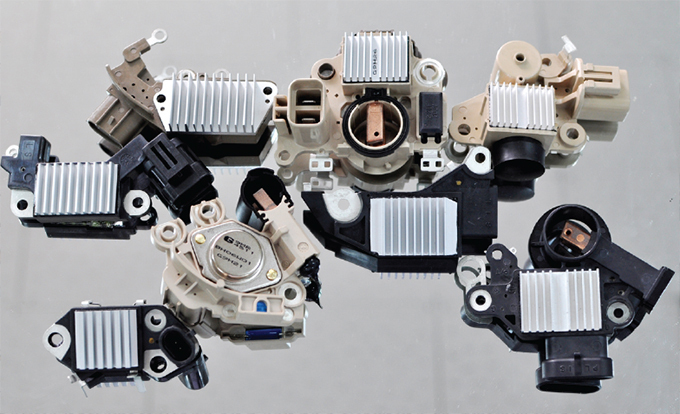 Now for Korean cars, 100types of alternator rectifiers are manufactured.